At Stop the Arms Fair, we try to make our events as accessible as possible. We recognise that different people have different access needs and it’s not always possible to meet people’s needs perfectly but we will do our best. We welcome feedback. We will have an information tent on site on each day of action with accessibility details, maps of the site, flyers and other information. 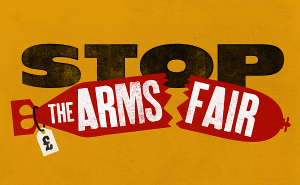 If you have any questions or feedback, please go to the info tent or contact info(at)stopthearmsfair*org*uk. We will have step-free access to the main sites, with ramps provided where level access does not already exist. We will provide a disabled access portaloo on site, at the East Gate. We will try to identify parking spaces so that people can drive if they need to for access reasons. We will have chairs available for anyone who has difficulty standing. They do not have arm rests. We will provide cushions if you require one. We recognise that some people will require assistance to attend the event. We welcome assistance animals and will be happy to provide water for them. King George V Park is nearby if you wish to take the animal to a green space. We will provide two toilets on site, one of which will be wheelchair accessible, at the East Gate. They will both be gender neutral. Information about the disabled access toilet can be found here. Needing to go off-site makes a lot of sense. If you want to get a cup of tea, a bowl of soup and to have a sit down, you can head to the Garden Community Cafe. The cafe is usually open 8.30 – 3.30 pm and will unfortunately not be open on Sunday. If you are experiencing stress and would like to relax and sit down with someone for a chat and a cup of tea off-site, you can go to our Support and Recovery space. This will be at St. Anne’s Church on Berwick Road (the road behind the Garden Community Cafe and a couple of minutes walk away). You can contact the Support and Recovery team on 07849 359985. This information will also be available in the info tent. We encourage people attending the demonstration to bring their own supplies as far as possible. We will provide water on site: ask in the information tent if it is not clear where to find it. We will also provide hot drinks and snacks, from the information tent. Food is being arranged by the working group organising each day of action. if you have specific questions about a specific day, please contact info(at)stopthearmsfair*org*uk and we will put you in touch with the contact person for that day who can answer your questions. Soup by donation will also be available at the Garden Community Cafe. The Cafe is usually open 8.30 – 3.30pm and will unfortunately not be open on Sunday. 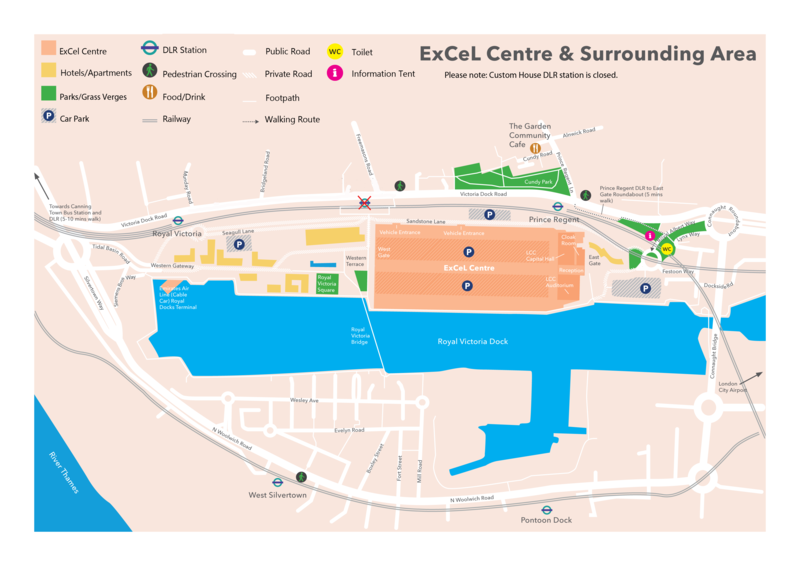 You can access the ExCel Centre on the DLR. Prince Regent station has a lift, a step of between 0-50mm between the train and the platform, and a gap of 0-85mm between train and platform. Royal Victoria station has a lift, a step of between 0-50mm between the train and the platform, and a gap of 0-85mm between train and platform. There are also bus routes, including those to Ilford, Stratford, Canning Town, East Ham and North Woolwich, and a night bus to Trafalgar Square. We are currently trying to secure some parking in the local area so that people who are coming by car, minibus or coach will be able to park. We will provide some large print materials on site. If you would like to receive large print materials in advance, please contact info(at)stopthearmsfair*org*uk. We can provide materials in advance in PDF version if this is useful for you. Unfortunately because of the nature of the space we are unable to provide a hearing loop. If you require a note taker and wish to attend the actions, please contact info(at)stopthearmsfair*org*uk and we will do our best to meet your needs. We understand that large demonstrations can present challenges for some people. If you want to get a cup of tea, some food and a sit down on a sofa, away from the action, you can head to the Garden Community Cafe. This may not be a quiet space, but will have fewer people and be away from the action. If you want to go to a quieter space off-site, this has been arranged. There will be a Support and Recovery space in St. Anne’s Church which is on Berwick Road, the road behind the Garden Community Cafe (and a couple of minutes walk away). You can contact the Support and Recovery team on 07849 359985. This information will also be available in the info tent. There will be a small stock of disposable earplugs in the info tent. Please feel free to take a pair if this would help you. The nearest pharmacy is Day Lewis (19 Freemasons Road, London E16 3AR), a 0.6 mile or 12 minute walk from where the information tent will be set up at the East Gate. It is open 8.30 – 6.30 weekdays, 9 am-1 pm on Saturday and closed on Sunday. Walking directions are here. The nearest Walk-In Centre is at Newham University Hospital (Glen Road, Plaistow, London E13 8SL) which is 2 miles from the East Gate. It is open 8 am – 11 pm every day. The nearest A & E is also located here. Driving directions are here. Our map of the site is available here. If you would like to tour the area online, we recommend you use Google StreetView or Google 3D.